Home » Face » Blush » I’m ready to Travel in Dior! I’m ready to Travel in Dior! 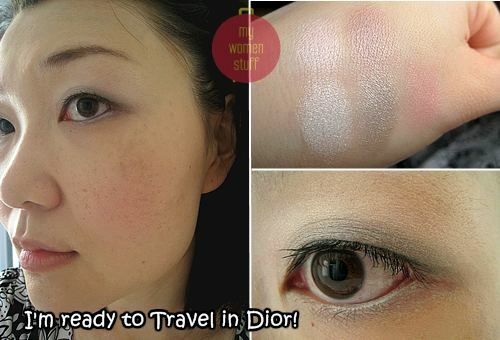 This is the Dior Travel in Dior palette that I was eyeing at Changi Airport and on the plane. I had it purchased for me at S$66 ($69 if you do not have a Krisflyer card) and I think its pretty decent although I’d safely say not everyone will like it. I am usually not drawn to travel palettes from any brand because I’m picky about colours and product combinations. I have a YSL travel palette I barely use because the colours just don’t appeal much to me and it looks like too much going on in one palette. I don’t think the quality is compromised in most travel palettes of the bigger cosmetics houses though – you get more or less the same quality of products as you do otherwise, but you might get some special colours not found in the normal line. The little face/blush brush, lip brush and dual sponge tipped applicator were kept in a separate section of the velveteen pouch the palette nestles in. The palette is an all in one face palette without mascara or tube lipgloss. I detest it when the mascara or lipgloss is finished and you have a hole where they used to be. I did find that the eyeshadows tended to be on the sheer, light and shimmery side. It brought to mind the Dior Parisian Lights palette for Spring 2009 so if you disliked those textures and colours, you will dislike this palette. I however, liked this palette because the colours are work friendly. I found that when I used a black pencil eyeliner first and then smudged colour over it, it added greater depth to the colours and helped the smokey grey shade stand out. I’m going to try this trick for Parisian Lights to see if the colours too will stand out more that way. Travel in Dior Rose Dragee blush is gorgeousness! The powder blush in Rose Dragee is gorgeous. Light and smooth milled, the colour is a straight light pink that you can layer on for greater intensity. There was no discernable shimmer – I loved it! The beige colour powder is a pressed powder. Beige 02 is slightly too dark for me so I’m not sure what I’d use it for. But at a pinch it might work for me. The lip colours are my sort of colours. I’m not so into lipgloss but this solid gloss does add shine to the rose lipstick. I’m happy I got the Dior Travel in Dior palette and I think the price is great (S$66 = RM158.50) for something as compact and all in one as this baby is. I’m not sure if its available at all Dior duty free counters but this was picked up from Singapore. If you have spotted this in other airports worldwide do holler! Darn… I think I’m turning into a Dior makeup fan – my poor protesting wallet! Do you like travel palettes? 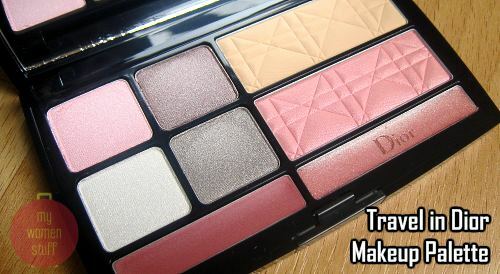 Which are the travel palettes you have tried and liked? PREVIOUS POST: I Nuovi Cosmetics Giveaway Winners! The lipstick and gloss are in the palette. Would you not mind that the powders got into them? Yes, I like this palette and makeups in any kind of palettes. Be it eyeshadows only, lipstick/glosses only or mixed palette, I love them all. But this one has e/s, blush, and for lips. This is the best combination! that is beautiful! anyone shop for one for me??? anyone?? I hope you get a hold of it. I’ll keep you in mind if I’m ever transiting in Changi any time soon. Love the colors…in the palette and on you! I agree that they are “office friendly”. I have a question:- I have been contemplating using grey shadow(love the shade in your palette) but I am not sure what shade would complement my skintone? Is there any guide to picking the correct shade of grey? Thank you! I’m not sure of your skin tone. For me, any grey shade works but I always prefer something with shimmer so it doesn’t look so flat. I’ll do a post showing my favourite grey shadows soon and maybe it could help? Ooh pretty palette! I’m always falling for travel palettes because I love the IDEA of taking only one with me. I umm.. don’t do too well with the practice though. Lol! I hardly comment about makeup but this is gorgeous! I go for travel palette! it works for you PB! Thanks! What sorts of travel palettes do you go for? This palette looks lovely. It works really well on you. I’ve never bought any travel palettes before mainly because they usually come with lipglosses/lipsticks. I can’t stand it when the powder is all over them. I must agree with the lip products thing. Thats the reason I always stay away from palettes but this one… was different hehe… to its credit there’s been no powder flying around. The palette does look very pretty but I must admit that i’m not a fan of lippies and eyeshadows on a single palette. I’m not sure if it is. I’ll report if I see it at KLIA. I will definitely look for these in duty free! Ooh… do report if you find it in other duty free stores! Yep! I don’t go for drastic colours when I travel too – its a lot harder to get it right! I’m glad you reviewed this product. I saw it at SFO duty free and wasn’t sure if I should get it, but I’ll definitely pick one up next time! I got the same pallete on my way back from HK, cost me HKD390, slightly more expensive. Is cosmetic cheaper in S’pore? Looks good on you, I have not try it out. I think the face powder is a bit fair too for me. I do love the pouch and brushes. I’m not sure about Singapore but I got it on board the plane. Glad you are liking it.